Cornwall, ON – An 18-year-old Cornwall woman was arrested on September 12th, 2018 on the strength of a warrant. It is alleged the woman failed to attend court on May 22nd, 2018 for a theft charge and a warrant was issued for her arrest. It is further alleged the woman attended a Brookdale Avenue business on June 13th, 2018 and removed merchandise, making no attempt to pay for the items as she left the store. On September 12th, 2018 a member of the Cornwall Community Police Service attended the Cornwall Courthouse as the woman was in custody for an unrelated matter. The warrant was executed and the woman remained in custody to await a bail hearing. Her name was not released as she was a youth at the time of the incident and is protected under the Youth Criminal Justice Act. 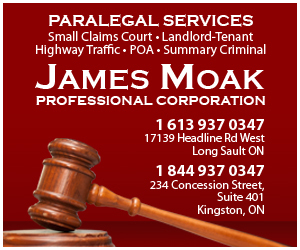 Cornwall, ON – A 35-year-old Lancaster man was arrested on September 12th, 2018 and charged with breach of recognizance for contacting his ex-girlfriend. It is alleged on September 2nd, 2018 the man contacted his ex-girlfriend, despite his conditions, and police were contacted to investigate. On September 12th, 2018, the man attended police headquarters to deal with the matter. He was taken into custody, charged accordingly and held for a bail hearing. His name was not released as it would identify the victim in the matter. Cornwall, ON – Joshua MacGregor, 33, of Ottawa was arrested on September 12th, 2018 on the strength of a warrant. It is alleged on January 15th, 2016 the man fled from police in a dangerous manner in a motor vehicle that did not belong to him. It is further alleged the man was driving while disqualified. An investigation ensued and a warrant was issued for his arrest. On September 12th, 2018 a member of the Cornwall Community Police Service assumed custody of the man at the Ottawa Courthouse as the man was in custody on the strength of Cornwall’s warrant. The warrant was executed and the man was held for a bail hearing. Cornwall, ON – Windell King, 37, of Cornwall was arrested on September 12th, 2018 and charged with dangerous operation of a motor vehicle, drive while disqualified, and breach of probation for failing to keep the peace. It is alleged on September 12th, 2018 the man was operating a motor vehicle in a dangerous manner in the area of Montreal Road and Alice Street. It is further alleged the man was driving while disqualified and an investigation ensued. During the investigation the man was taken into custody, charged accordingly and held for a bail hearing. There were 42 calls for service in the City of Cornwall in the last 24 hours (8 am the previous day to 8 am the day of the release).